WHO WILL WRITE OUR HISTORY? filmmaker Roberta Grossman will participate in a Q&A following the 1pm show on Thursday, 5/2 at the Town Center. A vital and sobering documentary. In November 1940, days after the Nazis sealed 450,000 Jews in the Warsaw Ghetto, a secret band of journalists, scholars and community leaders decided to fight back. Led by historian Emanuel Ringelblum and known by the code name Oyneg Shabes, this clandestine group vowed to defeat Nazi lies and propaganda not with guns or fists, but with pen and paper. Now, for the first time, their story is told. Based on the book by Samuel D. Kassow, WHO WILL WRITE OUR HISTORY mixes the writings of the Oyneg Shabes archive with new interviews, rarely seen archival footage and stunning dramatizations to transport us inside the Ghetto and the lives of these courageous resistance fighters. They defied their murderous enemy with the ultimate weapon – the truth – and risked everything so that their archive would survive the war, even if they did not. With narration by Academy Award winner Adrien Brody and Academy Award nominee Joan Allen. About the archive: In 1999, three document collections from Poland were included in UNESCO’s Memory of the World Register: the masterpieces of Chopin, the scientific works of Copernicus and the Oyneg Shabes Archive. The Oyneg Shabes Archive is the richest cache of eyewitness accounts to survive the Holocaust. 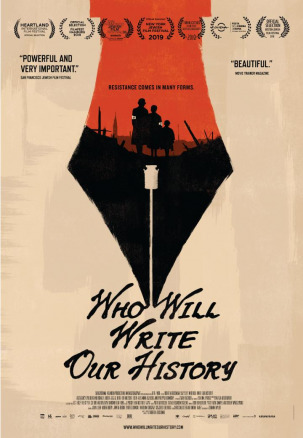 Despite its importance, the archive remains largely unknown outside academic circles, and the theatrical release and global event screening of WHO WILL WRITE OUR HISTORY is about to change that. Note: There were no showtimes for Fri, Feb 1st, so instead we're showing you showtimes for the next available date on Thu, May 2nd.